Farm Town Restaurant Not Using Local Ingredients? Autumn is not only a beautiful time of year (Jason’s favorite), it’s a delicious time of year. Earlier in autumn/late summer, you can find ripe peaches, plums, nectarines and cherries at your local market or grocery. Later on in autumn, pears and apples hit the scene. 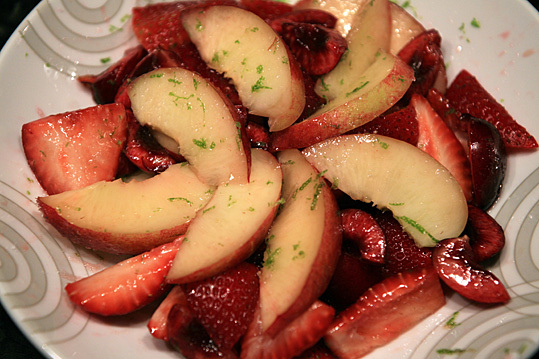 It’s easy to mix together a few varieties of the fresh fruit to make a healthy dish or snack. Experiment with your own combinations and let us know about your successes! Arrange the fruit in your serving platter. First add in the strawberries, sprinkle some of your sugar to macerate. Add in your cherries, tossing them about among the strawberries. Follow with your plums or nectarines by creating a circle to resemble a sun. Finish with an additional sprinkle of sugar and pour the lime juice down all over the fruit. Garnish with the lime zest.